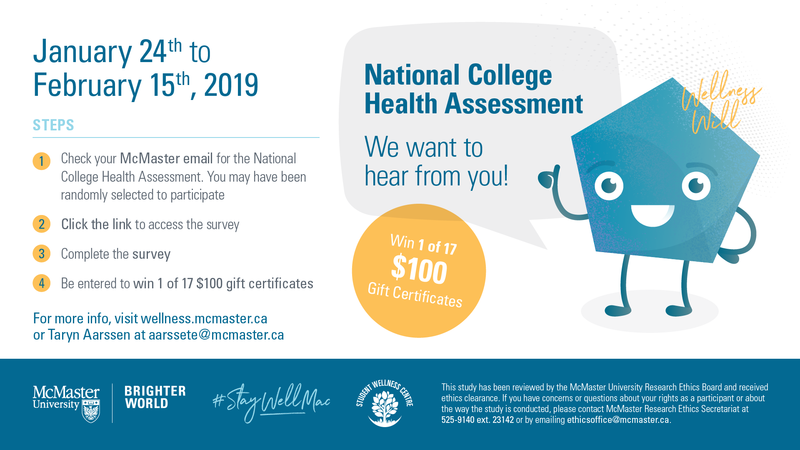 On January 24, a survey from the National College Health Assessment (NCHA) will be sent out to a randomized sample of McMaster students. The survey includes questions on a wide range of topics, including alcohol use, sexual health, and mental health. The data collected will help to identify the wellness needs of the student population, as well as improve the services offered by the Student Wellness Centre and the university. The data also informs education, programming, and policies at the university. The survey is open from January 24th to February 15th. Check your McMaster email, complete the survey, and be entered to win great prizes! Every survey helps build a healthier Mac.